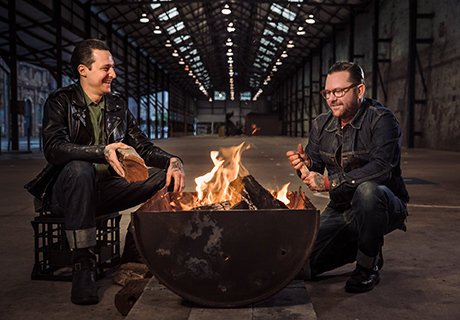 Carriageworks today announced the full line up for the Night Market curated by Ben Milgate and Elvis Abrahanowicz, founders of Porteño. Presented on Friday 27 July, fifty-five of Sydney’s leading restaurants, bars and producers will present menus evocative of the theme Burning Love, using smoke and spice, careful slow-cooking, heat and flame to showcase locally-sourced seasonal produce prepared by some of Australia’s best chefs at the leading edge of ​their practice. Participating in the Night Market for the first time, Carriageworks welcomes Morgan McGlone of Belles Hot Chicken, Andy Evans of Neil Perry’s Spice Temple, forever popular Mamak, Gelato Messina, Bodega 1904, Buffalo Dining Club, Alpha Restaurant, Ormeggio at The Spit and more. Chefs and restaurants returning to the Night Market will include Darren Robertson of Rocker Bondi and Three Blue Ducks, Kylie Kwong from Billy Kwong, Mike McEnearney of No.1 Bent Street, Palisa Anderson of Chat Thai, Michael Rantissi of Kepos Street Kitchen, along with the likes of Monty Koludrovic, Ben Sears of Paper Bird, Flavio Carnevale of Marta and more. Featured beverage offerings include beer from local Enmore brewers, Young Henrys and The Grifter Brewing Co., spirits from Demoiselle Distillery with a primal smoked vodka and smoked absinthe, a special blend from Archie Rose Distilling Co., and more from Earl’s Juke Joint, Jacoby’s Tiki Bar, Giorgio de Maria Fun Wines, Jed Wines, Jilly Wines, P&V Wine and Liquor Merchants, Poor Toms Gin and Regal Rouge Vermouth will serve a Smoke Spritz with Regal Rogue wild rosé, mezcal, charred plum, lemonade. Seedlip will serve a range of non-alcoholic drinks including Burnt Garden with Garden 108, smoked lemonade, charcoal citrus. A red hot line-up of bands will amplify the theme. The Van Demons, a local garage four-piece inspired by the sounds of The Chantays, Surfaris and Link Wray will bring authentic sounds of 1960’s instrumental surf era to life, and the new project of Jeremy Davidson (of The Snowdroppers), JD and the Hunger Men, will play country, blues, Americana, gypsy and rock with band-member Ben Hay DJ-ing throughout the evening. In keeping with the Night Market’s philosophy of celebration, collaboration and community, representatives from several community organisations including Two Good Co., OzHarvest and the National Indigenous Culinary Institute will feature at the Night Market.